Where to Buy Final Blox Rodenticide, Final All Weather Blox Poison Rodenticide - 18 Lb - $96.95 for Sale with Fast Free Shipping! Final All Weather Blox Poison Rodenticide - 18 Lb contains the powerful active ingredient, Brodifacoum, the strongest, single-feeding anticoagulant bait on the market today. By buying this product & leave product review you can collect normally 9 reward points as a voucher of $0.90(1%). Final All Weather Blox Poison Rodenticide - 18 Lb contains the powerful active ingredient, Brodifacoum, the strongest, single-feeding anticoagulant bait on the market today. When tested against other Brodifacoum baits, Bell's final was the preferred bait of rats and mice. Final Blox Poison Rodenticide - 18 Lb, with its distinctive cog-like shape, is made with more than 16 human food-grade, inert ingredients for a flavor rats and mice can't resist. The bait of choice in the pest control industry, Bell's patented All-Weather Blox are manufactured from Bell's unique extrusion process that yields a hard, multiple-edged bait with the palatability of a meal bait and the weatherability of a paraffinized bait. This highly weatherable block bait easily fits in tight baiting places. A hole in the center of this 20g Blox lets PMPs place it on bait securing rods in Bell's tamper-resistant bait stations, or nail or wire it in place. With Blox, you'll get unsurpassed rodent acceptance and control. The multiple edges appeal to a rodent's desire to gnaw. Blox work well in any condition -- wet or dry, indoors or out. 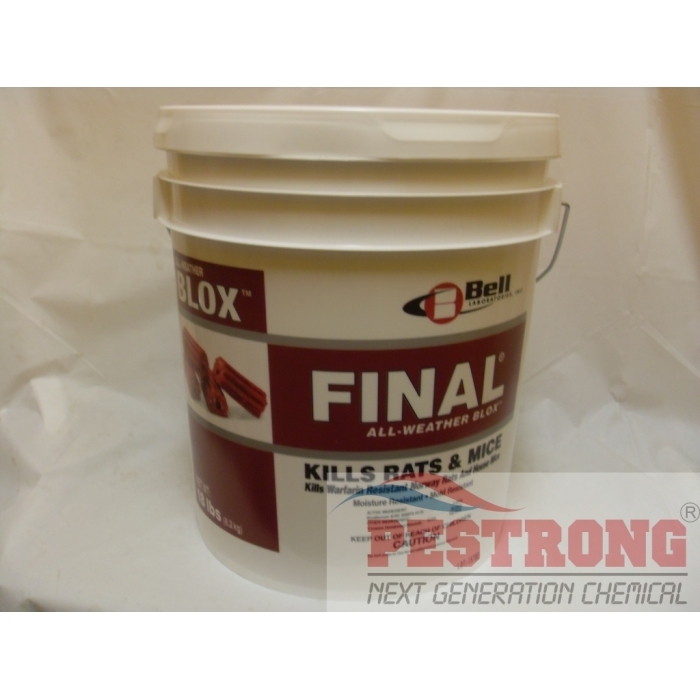 Ready-to-use Final Blox Poison Rodenticide - 18 Lb complements Bell's superior line of rodent baits, offering PMPs another tool to control rats and mice. Final Rodenticide is manufactured from an advanced formulation that produces a fresh tasting, highly compressed pellet, noted for outstanding flavor and a long shelf life. High recommended. This product truly does the job. I use it for rodents..... it is amazing.... put these packets out and no more rodents! I've used this. it's doing the job. I just scatter a couple of blocks where the nasty buggers are hanging out and replace them when they're gone. They don't need replacing as often now so it's working. Only draw back is finding dead smelly rats around the house.